What was it like at Mile High on Thursday night? Read firsthand reports from Jill at New West, Nicole at Notes From the Floor, and Blue Girl From a Red State (I especially like this one, written by 23-year-old Canyon County delegate Megan Nagel). Earlier in the day, 43rd State Blues captured video postcards home from these folks: Gail Bray, Grant Burgoyne, Larry LaRocco, Nicole LeFavour, Debu Majumdar, Obama chief of staff (and Boise High grad) Jim Messina, Megan Nagel and Estella Zamora, and the Northern Idaho delegation. A cheering Idaho delegation made "The Daily Show," 15 seconds into this clip. The Idaho Democratic Party has lots of great convention shots at its Flickr photostream. Citydesk has some, too. Thanks to Brett and Ira for helping with links throughout the big week. Idaho sends its thoughts and prayers to the Gulf Coast with the wish that storm damage is as light as possible. * In curtailing the convention's opening day, presumptive GOP nominee John McCain told USA Today, "I hope and pray that we will resume our normal operations as quickly as possible, but some of that, quite frankly, is in the hands of God." Chris Cilizza of The Washington Post assesses the possible political impacts of a swamped RNC in this post. Seems they've made a few last minute changes to tonight's DNC lineup. They've moved Governor Bill Richardson to the block of speakers that will include Governor Kaine, Congressman Mark Udall and former Vice President Gore. They also pushed Sheryl Crow the the end of the music segment. She'll be wrapping up here in a minute and we should expect the speechifying to get underway. Update (6:06 p.m. MST): Leave it to Mark Udall to go quoting Wallace Stegner! Governor Tim Kaine is in the house and he's movin' mountains: "Aren't we all tired of a Washington that doesn't have any faith in us? If we put our faith into action we can move mountains!" 6:20 p.m. (MST): Richardson is going right after John McCain as a flip-flopper and a candidate who doesn't think for himself. "America is ready for change, but John McCain has only changed his mind!" Wowser, Bill Richardson is on a roll. 6:26 p.m. (MST): Idaho blogger and enjoyable fella d2 has some things to say about the state of chaos on the floor of Mile High right now. Check it out. I am surely going to sleep better tonight knowing Stevie Wonder loves me. I'm betting a quarter McCain drops his VP announcement exactly when the curtain drops in Denver tonight. No, Stevie wonder and my quarter have nothing to do with one another...need I remind you I'm not Julie? 6:44 p.m. (MST): Vice President Gore has arrived at the podium & Serephin informs me videos are on their way...hold on to your seats, folks. Check out video of Grant Burgoyne, Nicole LeFavour, Gail Bray and Larry LaRocco as well as a video for Canyon County from the genius that is Serephin of 43SB. "Shoulda Been Prez" Al Gore is doing a great job of reminding us exactly who won the 2000 election! "In 2008, once again, we find ourselves at the end of an era with a mandate from history to launch a new beginning...inconvenient truths must be acknowledged if we are to have strong governance." Wow, I can't do this speech justice as fast (or slow) as I type. Keep an eye out for full text of Gore's speech. 7:02 p.m. (MST): Chris Matthews is saying that it's clear now that the Supreme Court controls far more than it should (privacy, women's reproductive rights, even the presidency) and this is exactly what Gore addressed the DNC to remind us of. 7:22 p.m. (MST): MSNBC reporting Durbin will introduce Obama within the hour. Joe Biden is now at the podium and I have absolutely no idea why. is introducing the American Voices Program participants. 7:29 p.m. (MST): Text via the DNC of Gore's speech and video via PoliticsTV. 7:44 p.m. (MST): d2 says more videos are coming our way once he and Serephin switch places. Seems the best received line so far tonight was one embattled American, by the name of Barney Smith, saying it's about time the people in power "put Barney Smith before Smith Barney." Had Harry Reid and Joe Biden on their feet. Here's another video from Serephin for ya'll up in northern Idaho. 7:58 p.m. (MST): Durbin, prior to the introduction of Obama: "This man, Barack Obama, has inspired American to believe that we can come together, meet the challenges of this new century and rise up to a better place." 8:14 p.m. (MST): It is not lost on me that the last time my party stood in a crowd even remotely this large, this open and this young was for the acceptance speech of President John F. Kennedy. Obama has accepted, he has thanked those that most deserve thanking (including Hillary Clinton "an inspiration to my daughters and yours" and Ted Kennedy the life-long public servant), and now he will launch into this historic speech. The dissecting will be left for the Blogmother herself. The sea of people at Mile High tonight is an unbelievable testament to the belief of America that this nation needs a new direction, this nation needs leadership and this nation DOES NOT need another four years of Bush tax cuts, No Child Left Behind, and an energy policy that makes absolutely no sense. Obama of the Republican leadership: "It is time for them to own their failure, it is time for us to change America." Obama is addressing his policy positions as only he can. He's hitting all the points, making all the promises. Speaking of health insurance and how we can all be covered; Assuring those of us that are working our way through college and those that will come behind us that we can afford it if we give our service to this nation. And he has done what the wise Governor Schweitzer said he should do--he has brought out the daughters. 8:56 p.m. (MST): Here it is, the mention of the greatest speech in the history of the United States of America. "The men and women gathered there could have heard many things, they could have heard words of anger...but what the people heard instead...is that we cannot turn back, American we cannot turn back, not with so much work to be done, with so many children to educate, so many veterans to care for...American we cannot turn back. We cannot walk alone at this moment, in this election, we much pledge once more to march into the future." Ladies and gentlemen it has been my pleasure to share this evening with you, goodnight. Update 10:00 p.m. from The Blogmother: Thank you, Tara, for recording this night for posterity here at RSR, and for including some great links from our friends in Denver. For now, here's the transcript of Obama's speech. That's right, you heard the Blogmother right, I'm live blogging the DNC events tonight while my fellow bloggers are out partying it up at Obama acceptance speech watch parties across the state. If you have pictures from the watch party where you are, please send one or two to the Blogmother at juliewrites at yahoo dot com, and she promises to try to include them in the slide show that will run later this evening. In case you'd like to take a look at the full schedule for tonight's event, the DNC website is the place to be. And, the McCain campaign released this ad congratulating Senator Obama this afternoon, if you haven't seen it you'll be hearing about (if not seeing it on every network) tonight. I hope you will all join me tonight with your comments, observations and general enthusiasm for this historic event. Update (3:01 p.m. MST): CSPAN is reporting things might be slow getting going tonight as the wait time to get into Mile High Stadium (er...Invesco Field) is over an hour right now. Also, our boys over at 43rd State Blues are saying the wait for trains is holding up their arrival at the field. 3:27 p.m. (MST): Yeah, I'm no Julie, so you'll have to get used to my style. Just throwing this out there--the band currently on stage inside Invesco is the Yonder Mountain String Band (together since 1998) and they aren't bad at all. Check them out on their website and at MySpace. 4:44 p.m. (MST): I think they may actually be a little ahead of schedule. Governor Dean has taken the stage and is giving credit where credit is due--the 50 state strategy. "Today our party knows that power grows from the grassroots up." Following Governor Dean will be a video and special tribute by Congressman John Lewis (D-Georgia) and the children of the late Dr. King. 4:57 p.m. (MST): Congressman Lewis has taken the stage, speaking of the day Martin Luther King, Jr. gave his "I have a dream speech" on the steps of the Lincoln Memorial. Lewis, referring to Dr. King as "a son of America, a citizen of the world, a peaceful warrior," says we have the power to make the dream a reality. "We still have a dream...the road to victory will not be easy...but with the nomination of Senator Barack Obama tonight...we are making a down payment on the realization of that dream." Man, I love John Lewis. "Yes, we've come a long way, but we have a distance to go. Yes, we've come a long way, but we must march again...we must march as we've never marched before to elect the next President of the United States, Barack Obama." I can't help but wish Rosa Parks were alive to see this; Rosa Parks, Medgar Evers, and every last civil rights leader. They are the true victors of this night. Now Rev. Bernice King, the daughter of Dr. King and Coretta Scott King, has taken the stage: "Tonight freedom rings from the snow-capped Rockies of Colorado, tonight freedom rings." Update (5:18 p.m. MST): I'm taking a break until Governor Kaine takes the stage, both to enjoy the music segment coming up and to grab some dinner. When I return around the 6 o'clock hour there will be a new thread to catch the remainder of the evening. Yes, I planned this knowing I'd have much to say about Rep. Lewis and Dr. King's children. "For those of us who stood on the steps of the Lincoln Memorial, or who in the years that followed may have lost hope, this moment is a testament to the power and vision of Martin Luther King Jr. It is a testament to the ability of a committed and determined people to make a difference in our society. It is a testament to the promise of America." Also, if you missed the MLK tribute video played after Rep. Lewis and before the two King children, here it is. See you in an hour! Check out these latest dispatches from Denver: Gary Allen, Gail Bray, "Adam & Eve," Debu Majumdar, and ReBecca Suits of the Idaho delegation have all gone on record with YouTube to say why they support Barack Obama. Maj and Justin StormoGipson blog about this morning's meeting with Obama's chief of staff, Boise High grad Jim Messina. There's much more on the IDP's daily convention page. Rescued from the comments (h/t Sisyphus), check out this great post by Jerry Brady on the meeting with Jim Messina. Here's a video of part of today's roll call, with Idaho right at the start, followed by a video of Hillary Clinton moving that Barack Obama be given the nomination by acclamation. 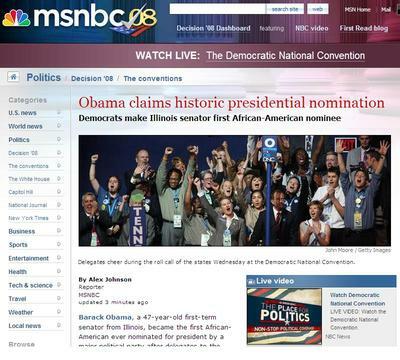 Finally, here's a screenshot of the MSNBC homepage shortly after Obama's nomination, captured by Brett Adler. Click to make it bigger.
" the job of the next president is to rebuild the American dream and restore U.S. leadership in the world." ... says he is convinced that "Barack Obama is the man for this job." Says that in Obama's first major decision, his VP pick, "he hit it out of the park." (Do you think this will quiet the Mitt Romneys and Carly Fiorinas?) ... says unequivocally that Obama is ready to be president. 7:27 p.m.: Clinton is done. I think he was supposed to speak eight minutes. Shades of his address at the 1988 DNC ... Jill has a firsthand account at New West. I've found a YouTube of Keith Roark's Idaho roll call speech ... most of it, anyway. It runs out before he gives shout-outs to Debbie Holmes, Walt Minnick, and Larry LaRocco, and before he mentions that Idaho gave Obama his largest margin in the primaries. That raised the roof. Very cool. Update: Here's a better one. 7:37 p.m.: John Kerry is talking about John McCain, whom he says has been a friend for 25 years. Dismissing the "myth of the maverick," he cites a string of flip-flops McCain has made as his party's nominee, adding "Before he ever debates Barack Obama, John McCain should finish the debate with himself." Blasts McCain for using Karl Rove staff and tactics, but that "America will reject them in 2008." ... hey, Kerry just introduced Barack's Uncle Charlie, who is sitting with Michelle. Kerry says that Obama will end the politics of swift-boating and tell the merchants of fear, "You don't decide who loves this country. You don't decide who is a patriot." 7:53 p.m.: "The Grand Old Party is no longer grand. It's just old." - Rear Adm. John Huston, a lifelong Republican who just switched his party registration to Democrat. 7:57 p.m.: It's George W. Bush's Congressman, Chet Edwards, a.k.a. the man who may have been VP, if not for his unfortunate last name. He has a great resume, but I think Obama picked the right guy with Biden. 8:01 p.m.: This video on the military is pretty good, huh? It should be; Steven Spielberg made it. Hey, and nice narration by part-time Idahoan Tom Hanks. 8:29 p.m.: Tell 'em what for, Joe! Here we go ... "I accept your nomination to run and serve with Barack Obama, the next President of the United States of America." ... His stories of the kitchen-table conversations he imagines while riding Amtrak home from D.C. show that Biden has a rock-solid sense of what it's like to live in the middle class, to have homes falling in value, food and gas costs on the rise, and crushing health care decisions ... Says John McCain is a friend, but that he "profoundly disagrees" with the direction he wants to take this country. 8:55 p.m.: Biden finishes, and his wife Jill says they have a special surprise guest. Barack has arrived to thank the Bidens, the Clintons, the delegates ... there's a real sense now that the torch has been passed and Generation Obama is ready to roll. Day 3 of the Democratic National Convention gets under way at 3 p.m. Mountain/2 p.m. Pacific today. Here's today's full schedule. The famous roll call of states should start at about 3:30 p.m. Be sure to listen for Idaho! I'll update this post a little later with links to the latest coverage from Denver. For now, check out these great photos taken by Justin StormoGipson and posted at the Idaho for Obama site. And here's more: Jerry Brady writes about media coverage of the convention at the IDP site ... Nicole LeFavour recounts Hillary Clinton's Tuesday-night appearance and its aftermath at Notes From the Floor ... T.J. Thomson and Jill Kuraitis have been filing reports from Denver on KFXD. They're archived iin the "Must-Hear and See" section of the station's website. Update 3 p.m.: C-SPAN is showing Barack Obama's jet touching down in Denver, following a campaign stop in Montana. Senator Clinton has released her delegates, and the roll call is just a half-hour away. We'll have a new thread up by dinnertime to cover the speeches by Bill Clinton (around 7 p.m. Mountain) and VP nominee Joe Biden (at 8:30). 3:22 p.m.: The nomination speeches have begin. Dolores Huerta, the famous co-founder (with Cesar Chavez) of the United Farm Workers, is nominating Hillary Clinton, saying. "I stand with Hillary Clinton as she stands with Barack Obama to take our country back." Seconded by Apollo Pazel of Utah, the third-youngest delegate in Denver, and Denise Williams Harris of New York. 3:31 p.m.: Now it's Obama's turn and he is being nominated by Michael Wilson, a registered Republican and Iraq War medic. U.S. Sen. Ken Salazar is offering the first second, saying, "Welcome to the West, where we are building th new Democratic majority." Rep. Debbie Wasserman-Schulz of Florida, former co-chair of Hillary Clinton's campaign, offers another second for Obama. The final second comes from Rep. Artur Davis of Alabama. 4:39 p.m.: We're getting close. New Jersey just gave all 127 of its votes to Obama. He has 1,549.5 and needs 2,210 to be nominated. 4:45 p.m.: Hillary Clinton is giving the New York vote ... "with eyes firmly fixed on the future in the spirit of unity and a goal of victory ...," she moves that the convention suspends the roll call and declare Obama the nominee by acclamation. Pandemonium!!! I wanted to stick with a blog that I've written with already so here I am! Here's a quick review, don't want to take up too much space. I have to hand it to Hillary Clinton, she gave a great unifying speech last night. I talked with Hillary supporters from Texas and they we're moved to follow in her lead and support Barack Obama as President of the United States. She made it clear in her speech that by putting your support behind Barack Obama, you will be supporting values that are close to her and the Democratic party that she has worked for all of her life, which was key to what needed to be said. It was really great to hear from Gov. Kathleen Sebelius as well! Oh, and I've taken great pictues with different people, including Howard Dean! I went to the Young Democrats Caucus yesterday and got influenced from so many young leaders from across the country, I will be bringing back some very valuable information, and I'm looking forward to the next one tomorrow afternoon before the acceptance speech from our next President. Well, that's all for now. Thank you all so much for your support in getting me here and know that I'm bringing back tons and tons of stuff for all the counties across the state of Idaho! I'm having the time of my life, better run so I can make it to some more Young Democrat events.